Then again, we suspect there are straightforward reasons why we haven’t seen one of these yet. Maybe Milwaukee doesn’t have the open SKUs with resellers to stuff in something this niche. Or maybe there aren’t enough folks out there requesting it to justify the high cost of designing, building, testing, and deploying it. Regardless, we’d like to hear what the rest of you Toolmongers think: Good idea or a waste of time? Let us know in comments. 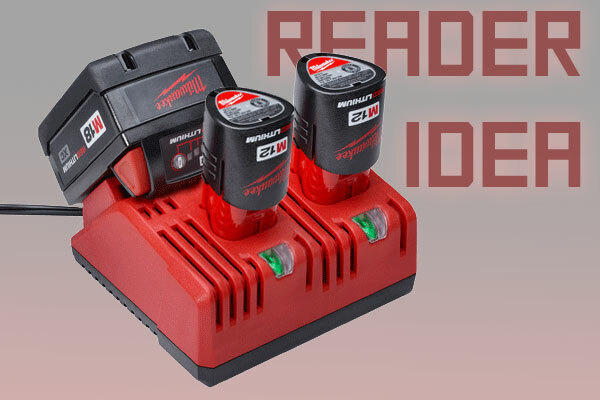 I’ve made many suggestions about creating a similarly designed charger to charge Craftsman’s 19.2 and 12v lines as well. I use both platforms actively when I am woodworking and would love to have one charger to do everything for me at the same time. I currently have only the individual M12 and M18 chargers but it’s pretty common for me to have two M12 chargers and a M18 charger going at once. That’s partially because I have 5 M12 batteries (with 4 M12 tools) so I frequently forget to dig out the chargers and charge them until at least 4 of them are dead. Whereas I have one M12 tool and 2 M12 large batteries. Meant that to say “one M18 tool and 2 M18 large batteries.” My M18 impact got stolen so I just have my M18 hammer drill. I have an old Ridgid dual charger that came with an 18v combo set. It is really nice to be able to charge 2 or the 3 batteries at once. I have 3 M12 tools, something like this might convince me to switch my 18v stuff from Red to Orange when the time comes (soon). I’ve always wondered why Ryobi is the only one offering a 6 bay battery charger. I know I still keep my V18/28 3 bay charger busy. I really hate having to set up a table just to support all the battery chargers that end up onsite. I guess I’m someone who probably wouldnt buy the multi charger. As a DIY and home user i’m probably not going to buy an additional battery charger when many tools include a charger. I have some m12 tools, 3 have included chargers, so I have 3 single m12 chargers. I am not going to spend $50-100 for another charger when I already have 3 of them that came with the tools.